Whenever you mention The Eagles so someone, it’s likely that the first song that will spring to mind will be Hotel California, which, although was their biggest UK hit and one of their five American chart-topping singles, is arguably not their best track. Naturally, that will be an opinion, but for a lot of people, songs with meanings are usually preferred and when it comes to the Eagles, Lyin’ Eyes is likely to fit the bill. The original Eagles comprised Glenn Frey, Don Henley, Bernie Leadon and Randy Meisner and were effectively assembled by Linda Ronstadt in 1971 as her own touring band. Each had a musical background with Henley being in a band called Shiloh, Frey had worked with Bob Seger, Leadon was a member of the Flying Burrito Brothers and Meisner had been in Poco and it was because of their friendship with Jackson Browne that they got signed to Asylum records. This new sound continued into their next album, One of These Nights, in 1975. The title track was the first release and gave them their first UK hit single where it reached number 23. 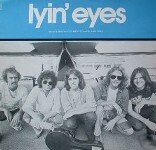 The next single was Lyin’ Eyes, a six and a half minute track which was going to be difficult to get airplay play as the radio programmers were reluctant to entertain any over four minutes. Naturally there were exceptions like Hey Jude at just over seven minutes and Bohemian Rhapsody which was almost six minutes and only wasn’t edited on Freddie Mercury’s insistence. In the US, it came out as the full length single, but in the UK, it was blasphemously edited to a dreadful three minutes 50 seconds and completely ruined the story sentiment of the song. It had the entire second verse, the second chorus and four lines in the middle of the third verse removed just for radio purposes. Thankfully now, with radio stations being a little less fussy, whilst still sticking to ‘safe’ songs, you can often hear the proper version. Another reason is probably because all the versions on CD are the full length one and to get the radio edit, you’d need to take it from the vinyl and most radio stations wouldn’t bother with that. The song is about a woman who cheats on her husband because she is very confused and down, and tells her husband she is going to see a friend when she is actually going to meet her lover. She goes across to the other side of town to meet the boy with ‘fiery eyes and dreams no one can steal.’ She gets there and she falls into his arms, but has to leave to go back home. She swears someday she will come back forever, because she is happy there. As the song continues, she ponders her emotions wondering ‘How it ever got this crazy’ she just wants to feel loved and happy but she is torn. The single version of the song earned a Grammy nomination for Record of the Year but lost out, ironically, to Captain and Tennille’s Love Will Keep Us Together, they did, however, win a Grammy for Best Vocal Group Performance. In 2008, an Irish prosecutor, in her closing statement at a trial involving the email lyingeyes98@yahoo.ie, quoted the line ‘You can’t hide those lyin’ eyes’ to a woman called Sharon Collins just before a Dublin jury convicted her of conspiring to have her older partner and his two sons killed. She used the lyingeyes98 email, to contract a Las Vegas hitman to do the deed, apparently unaware that emails can be traced. Sharon was sentenced to six years in Mountjoy Prison where she served just over four years and at the time of her release she was planning a memoir which was going to call Lyin’ Eyes.